Common Names: Common Angel Shark, Angel Shark, Angelshark. Light brown to grey flattened body with light lines that mimic ridges in the sand. Small dark spots cover most of dorsum. Spots combine in centre of pectoral fins to create dark bands. Terminal mouth with simple barbells and one pair of lightly fringed nasal skin flaps. Size: At birth 24-30cm. At maturity 126-167cm. Maximum recorded size 183cm. Found on sand or mud often around rocks. In estuaries, bays, and sometimes in sea grass beds. Depth range from inshore to at least 150m on the continental shelf. North eastern Atlantic . Previously from Norway to Mauritania including the Black Sea and Mediterranean. Now locally extinct in some areas including the North Sea. Common Angel Sharks are still common around the Canary Islands. They are seasonally migratory and disappear from most shallow areas in the summer months. Conversely, aggregations of up to 100 animals have been reported during summer in bays on the north side of Gran Canaria. Common Angel Sharks are ambush predators that lay in wait partially buried in the sand. Their diet includes flatfishes, skates, crustaceans and molluscs. Angel sharks choose their resting sites based on their success at ambush hunting in a particular spot. Once selected they use their pectoral fins to dust away enough sand to create a depression that they can settle into. If hunting is good they will remain in the same spot for extended periods. Ovoviviparous with no yolk sac placenta. Recorded litter size from 7-25. Size of litter depends on size of female. The common angel shark (Squatina squatina) was formerly common throughout large areas of coastal and outer continental shelf seas in the Northeast Atlantic, Mediterranean and Black Seas. Most of this region is now subject to intense demersal fisheries, and the species is highly catchable from birth onwards and is taken as bycatch in demersal trawls, set nets and bottom longlines operating through most of its range and habitat. As a result of its slow life history characteristics and bycatch in fisheries with steadily increasing effort and capacity, its abundance has markedly declined during the past 50 years to the point where it has been declared locally extinct in the North Sea and is locally extinct from large areas of the northern Mediterranean Sea. It is now undetectable throughout most of the remainder of its range, with the exception of the Canary Islands where effective conservation measures are required urgently. 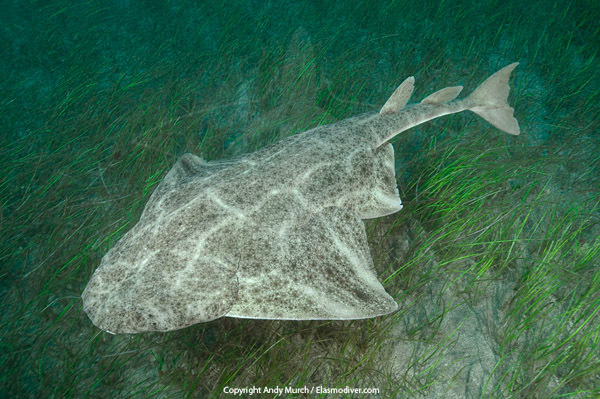 Angelshark is therefore assessed as Critically Endangered under criteria A2bcd+3d on the basis of estimated and suspected past declines of at least 80% over three generations and the likelihood of continuing future declines resulting from fishing pressure. El Cabron Marine Park, Arinaga, Gran Canaria, Canary Islands, Eastern Atlantic. 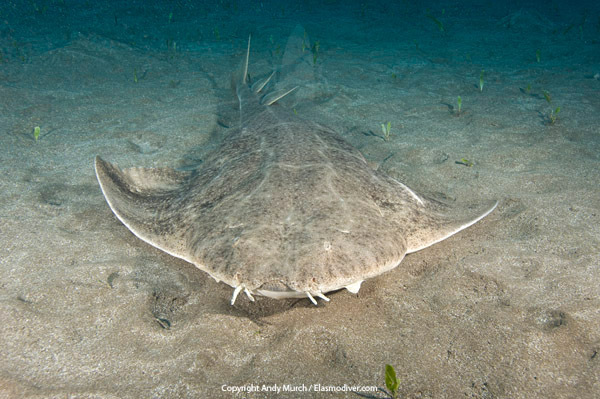 Two other Angel Sharks share Common Angel Shark's southern range: The Sawback Angel Shark Squatina aculeata is found from the Mediterranean to Namibia. It has a distinctive row of thorns running along the centre line of its back. It is usually found in deeper water from 30 to 500m. The Smoothback Angel Shark Squatina oculata is also found from the med to southern Africa is spotted but has no lines and is rarely found above 50m. Remains completely motionless relying on camouflage. Reluctant to move even when a diver partially exposes it by fanning the sand away from its back. One account of a Common Angel Shark rising off the bottom and circling a diver with it's mouth open. The best place to see Common Angel Sharks is in the Canary Islands. Sightings occur throughout the chain but it helps to dive with an operator that knows where to find them. Davey Jones Dive Centre is situated in Arinaga on the south side of Gran Canaria. They organise shore diving trips to the El Cabron Marine Park which is just outside town. The park has an almost year round population of Angel Sharks and the guides from Davey Jones are very good at finding them under the sand. More details available on the Canary Islands page in the Shark Diving Hotspots section.